Our most vital nutrient is Water. So is it fair to compare it to any other drink? You be the judge by scrolling through the exercise attached. If nothing else, you will have a better appreciation of the importance of consuming enough water daily. - In 37% of Americans, the thirst mechanism is so weak that it is mistaken for hunger. - One glass of water will shut down midnight hunger pangs for almost 100% of the dieters studied in a University of Washington research. - Lack of water is the #1 trigger of daytime fatigue. - Drinking 5 glasses of water daily decreases the risk of colon cancer by 45%, plus it can slash the risk of breast cancer by 79%., and one is 50% less likely to develop bladder cancer. Are you drinking the amount of water you should drink every day, the amount of which depends on the climate and your level of activity? - In many states the highway patrol carries two gallons of Coke in the trunk to remove blood from the highway after a car accident. - You can put a T-bone steak in a bowl of Coke and it will be gone in two days. - To clean a toilet: Pour a can of Coca-Cola into the toilet bowl and let the 'real thing' sit for one hour, then flush clean. 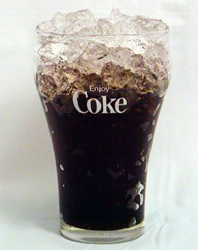 The citric acid in Coke removes stains from vitreous china. - To remove rust spots from chrome car bumpers: Rub the bumper with a rumpled-up piece of Reynolds Wrap aluminum foil dipped in Coca-Cola. - To clean corrosion from car battery terminals: Pour a can of Coca-Cola over the terminals to bubble away the corrosion. - To loosen a rusted bolt: Apply a cloth soaked in Coca-Cola to the rusted bolt for several minutes. - To remove grease from clothes: Empty a can of Coke into the load of greasy clothes, add detergent, and run through a regular cycle. The Coca-Cola will help loosen grease stains. It will also clean road haze from your windshield. - the active ingredient in Coke is phosphoric acid. It will dissolve a nail in about four days. Phosphoric acid also leaches calcium from bones and is a major contributor to the rising increase of osteoporosis. - To carry Coca-Cola syrup! (the concentrate) the commercial trucks must use Hazardous Material place cards reserved for highly corrosive materials. - The distributors of Coke have been using it to clean engines of the trucks for about 20 years!